Happy Halloween, readers on the The Daily Magi and the Magi Football Blog. 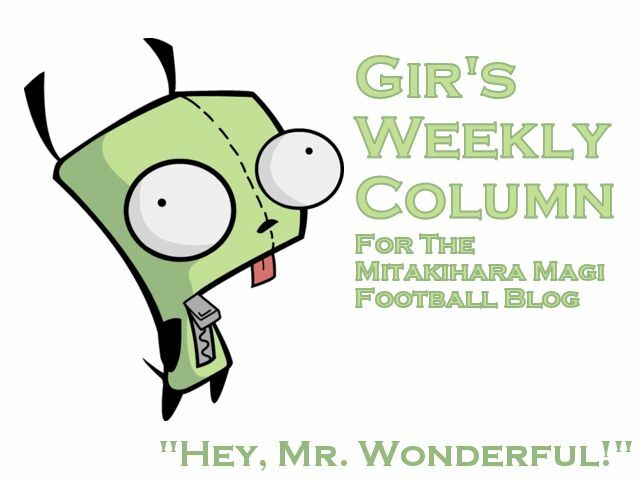 I am Gir Todafunk with another Weekly Column, and this week, we are facing the Fresno State Bulldogs in a game that has been deemed the Game of the Week by ESPN. Not sure why; Fresno are 2-5 on the year and have truly sucked. Oh well. Going to be another cakewalk for us, I guess. Anyway, what about that Haruyuki Arita, eh? He is now College Football's all-time leading passer, with 19,230 yards to his credit. Simply amazing. Over three miles worth of distance. He's got speed, shiftiness, and a cannon of an arm. I think he's going to ease his way to 20,000 passing yards for his career. He's got all of November and at least one more game in the postseason to get it done. Congrats to The Pig on finally making history. As for me, I finally got my dues. I got a tackle and four interceptions. Woo hoo! First-ever conference Player of the Week Award. Such a wonderful honor bestowed on Mr. Wonderful. Too bad some unknown dude from North Texas (where is that?) ended up winning national player the week honors. But it's a good start, and hopefully, I can add a few more honors before this season is over. I don't understand why it took this long for me to finally get my dues. I think we got, like, 28 interceptions that game. We sent Boise to the woodshed that game and hung 255 on them. That's four opponents that we dumped over 200 points on. We're a powerhouse, a big, tough, in-your-face powerhouse that doesn't take any mess from anybody. We come at you hard and we deliver early and often. That's Magi football right there. I don't think we're going to be too troubled by what Fresno State intends to do. We're most likely going to put the ball on the ground and run it down their throats. Not a lot of razzle-dazzle. It's back to the old option packages, with maybe a few pass plays but only as a changeup. Hopefully I get a few more picks and a lot more tackles this season before it's a done deal. I can't wait for the road trip, when we head to San Diego, Honolulu and Laramie in the span of three weeks. That's it for me on this blog but stay tuned next week as I get to savor some of the burritos in San Diego. I'm Gir, Mr. Wonderful, signing off. You are not alone.